Leaning to one side or another, tilting sideways, and laying flat is a common and very general symptom in a sick or stressed discus fish. This behavior usually happens at the dark corners of the aquarium, near the surface, or at the bottom of the tank. Tilting and laying down to one side or another among discus is just a symptom or sign, not a disease by itself and can implies many diseases and/or stress causes. 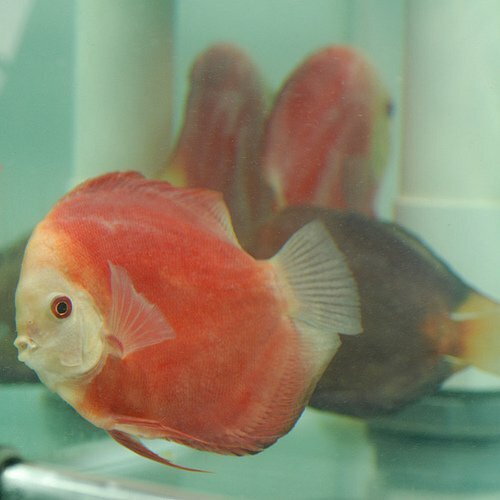 Discus Plague or Black Disease is one of the most common issues that cause discus leaning and tilting to one side. Gill flukes are another reason to laying down in discus fish. External protozoan parasites such as costia, chilodonella, Ichthyophthirius (Fish Ich), and etc. High ammonia levels can also cause tilting and leaning in discus. High levels of stress, especially in young fishes. Sudden change in water parameters like pH shock can lead discus fish leaning to one side and laying down. Too high water temperature. normally the discus fish should be kept at 28°C. High salt level in aquarium or strong salt bath. keep in mind that discus is not a marine fish! Poisoning of chemicals, medicines or or whatever. toxic aquarium water can not be tolerated by discus fish. chlorine and chloramine are the most common causes of poisoning in a discus tank. Extreme thinness and weakness. nutritional efficiency can cause of tilting, leaning, and laying flat on the bottom of the tank in discus. Serious digestive and intestinal diseases. As a discus keeper, you must be able to find out why are your discus fish tilting and laying flat on the sideways in the tank. It’s always important to monitor your aquarium water and fishes since any change in the behavior of a fish can be a sign disease in the tank.